Lose That Excess Weight Forever! I hesitate to use the word “diet”, when describing the Best Anti Aging Diet Program, because to many people it conjures up images of failed attempts to lose weight. Since this program is so much more than a diet, just think of “diet” as a time when you can only eat specific foods for a little while! When you read, (and you have--haven't you?) The Weight Loss Cure Protocol Diet (WLPC) as outlined in "Dr. Simeons Pounds and Inches, A New Approach to Obesity" you discovered that only 500 calories per day are allowed. However, remember that the HCG Drops are making extra calories, from your abnormal fat reserves, available for your body to burn as fuel. You will find this anti aging diet program to be quite simple and very rewarding. What can I eat and drink on this program? 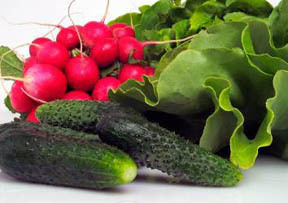 - One type of vegetable only-- radishes,cucumber, lettuce, fennel, cabbage, tomatoes, onions, spinach, chard, asparagus or beet greens. Dinner - The same 4 choices as lunch. All food and drinks not listed are forbidden. Do take note of specific restrictions; such as 2 small apples instead one large one (weighing the same) are not allowed, although there is no restriction on the size of 1 apple. What does my daily menu look like? You may have 8 of the specified food items each day. Yes, it is necessary to ensure that the amount of meat you prepare is exactly the allowed amount. It is best to weigh every portion before you bag it for freezing. Measure 3 ounces cooked, (100 grams) or 31/2 ounces of uncooked meat for lunch and dinner. Do I need a special scale? Yes, you should purchase, if you do not already own, a digital kitchen food scale. The model that I use is shown here. This particular kitchen scale has a capacity of 1 gram to 12 lbs. That more than covers the weight range you need. Although this is the scale that I chose, you may prefer a different model. Accuracy is the most important feature. Do I need to weigh any of my other foods? Thankfully no. You only need to weigh your meat. The only other measurement is a handful of the allowed fruits or vegetables. That is your hand not your partner’s with the big hands. Can I move food in my menu? I am a breakfast person, so I found that only having tea or coffee for breakfast did not work. Still staying within the program, I had an apple or orange for breakfast and did not have any fruit with my lunch. Although it meant that I could only have 3 items for lunch instead of 4, that worked! You may experience some hunger pangs during the first couple of days. Personally, I could not decide if I was really hungry or was it just the habit of eating whatever and whenever that was causing me to think of food. If you crave sweets, consciously avoid them until your system adjusts to not getting those goodies that are so dangerous to your weight loss. To help offset these cravings you are allowed to use the natural sweetener “stevia”. How do I handle unexpected food temptations? Normally, when you take the HCG Drops before you eat, you will find that you do not experience any hunger pangs. However, if you think you might have occasions when it will be very difficult to resist the food, I suggest that you have a bottle of water on hand that you can drink when you feel tempted to eat. Often all you need is something (water) to swallow and push back at any thoughts of food. Another helpful hint is always carry a copy of the "Pocket Guide to the HCG Protocol" by Tiffany and Linda Prinster. This handy booklet is a perfect reference to the Weight Loss Cure Protocol. It allows you to quickly identify the foods choices you can have without compromising your anti aging weight loss program. Do be aware that when attending special events, your family or friends will, all in kindness, encourage you to eat outside of your plan. They will honestly feel that one or two little discrepancies will not affect your weight loss. Please do not be tempted to stray even a little bit from the anti aging diet program. Dr. Simeons explains under the sub-heading “Faulty Dieting” the effect of giving in to temptation. It really is not worth it! Linda & Tiffany Prinster have authored 5 books that are dedicated to Dr. A.T.W. Simeons Weight Loss Cure Protocol (WLCP). Each book is an excellent and reliable source of recipes and information as you work your way through the program. The recipes presented in the “101 Worry-Free HCG Diet Recipes Plus Hints & Tips" takes all the stress away from worrying about what you can eat in phase 2. When planning your meals, the following steps can help you stay on track. 1. Select the recipes that you would like to prepare for the week. 2. List the ingredients that you need for each recipe. 3. Shop for those items. 4. Weigh, cook and freeze your meat for the week. The snack or small size freezer bags are just the right size to freeze each individual meal. A personal size cooler with a freezer pak is ideal to hold your special food when on the road. When you start to lose weight, there is a wonderful sense of achievement that is both motivating and exciting. Congratulations! You are now in the know! You have completed the Section on Weight Loss in the Anti Aging Forty Plus Guide. In this section you caught a glimpse of a remarkable Anti Aging Diet Program. Now the next step is up to you. Do you make the commitment and take the next step? It may very well change your life. The Anti Aging Weight Loss Program will certainly change your image of yourself, both mentally and physically. I really hope you decide to take the next step and lose those pounds that have clung to you like glue, throughout every other weight loss program you have ever tried. Share Your Anti Aging Weight Loss Story! Have you done it? Share your success stories with others. Allow them to comment and share their own stories. Include a "before" and "after" photo. Do you have "before" and "after" pictures you want to add? Great! Click the button and find the "before" picture on your computer. Select it and click on the button to choose it. Then click on the link, if you want to upload up to 3 more images. Tip: The maximum image size accepted is 800x600. Please resize your photos before you upload.